Young pilgrims on the march and nearing the finish line. Image: Diocese of Parramatta. 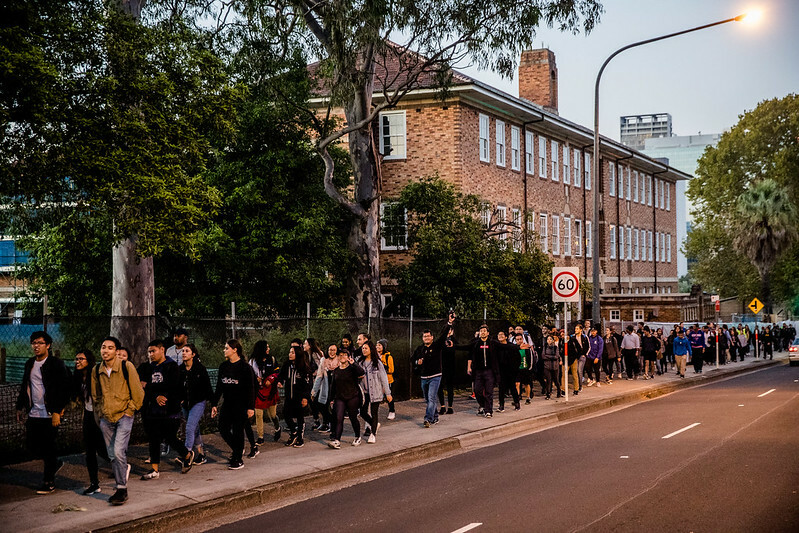 1,400 Catholic youth from Western Sydney and the Blue Mountains participated in the annual 21 kilometre Good Friday overnight pilgrimage from Blacktown to Parramatta. The walkers set off from St Patrick’s Church, Blacktown at 10pm on Friday 14 April and arrived at St Patrick’s Cathedral, Parramatta at around 6.00am on Saturday 15 April. They made regular prayer and reflections stops at parishes in Seven Hills, Toongabbie, Wentworthville and Merrylands. To view images from the Good Friday Walk, click here. Praying with the pilgrims at their departure point in Blacktown, Bishop Vincent wished them well and was “astounded” at the number of young people before him. In its ninth year, the overnight walk was organised by Catholic Youth Parramatta – Diocese of Parramatta. James Camden, Director of Catholic Youth Parramatta said the pilgrimage attracts a large number of youth, despite the various challenges faced by the Church today. “I was surprised by the number of young people who took part in the walk when I first started. At a time when the general public feels that young people are walking away from the Church we have these young people that are standing up for what they believe in and expressing what their faith means to them,” Mr Camden said.